This book is totally adorable! Have you been wanting to once and for all become one with your sewing machine? Are you tired of being intimidated? 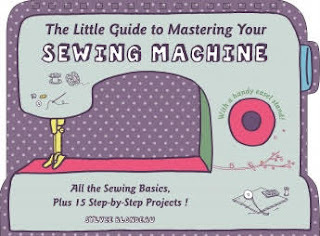 Well, Sylvie Blondeau has the remedy for your fears in her new book, The Little Guide to Mastering Your Sewing Machine: All the Sewing Basics, Plus 15 Step-by-Step Projects, published by Schiffer Publishing. Flip the book over, and there are 15 sweet projects to guide you through using all your new skills. Because everyone knows, if you don't use new techniques pretty quickly, you don't truly own them. The projects include a reversible hat, cushions, curtains, a tote bag, a baby quilt, a table runner, and more! So pull it out of storage, dust it off, and prepare to be amazed just how easy it is to do your own basic sewing by machine! 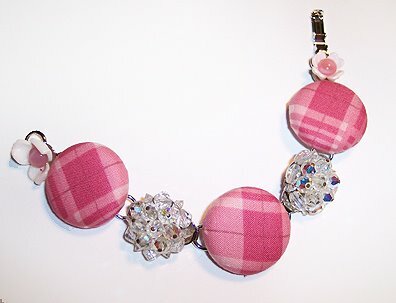 For those of you who love to make wearables, I've got some jewelry tutorials to catch you up on! 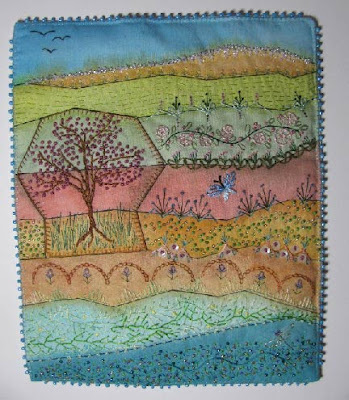 The links will take you directly to the tutorials over on Beading Arts. 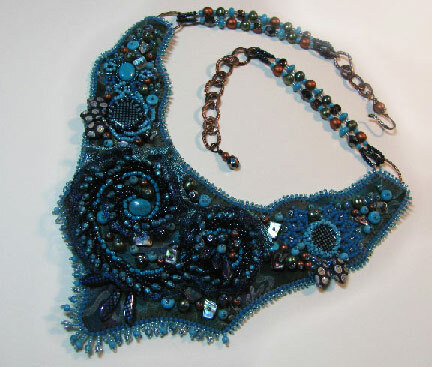 For older pieces, make sure you check out the Tab at the top of this page marked Wearable Art. A two-part tutorial for this quilt can be found on Beading Arts! Hi, I'm Cyndi, and I've been writing and updating Mixed Media Artist since 2005. If you're a new visitor, welcome! Come travel with me through a mixed media art wonderland, where no materials are considered too strange to use in making something! My constant cry as a young child was, “Please Mommy! Don’t throw that out. I can make something out of that!” No surprise that years later, it became the cry of my daughter as well (pictured above). It’s wonderful having a kindred spirit to share with. I hope that you each have someone in your life to share your passions with, and I hope that you’ll come and share them with me as well. A few years ago, I had to cut back and consolidate a bit in my writing, so Mixed Media Artist has become more or less of an archive site, filled with tutorials on image transfers, fabric and paper painting, art quilts, collage, digital work, book arts, and wearables. You will find links to all of these up in the tabs at the top of the page. Every new post that I add to the site, however infrequently, will be indexed in one of those round-ups. Please visit me at Beading Arts for more frequent updates and my latest work and tutorials. Copyright 2016 Cyndi Lavin. All rights reserved. None of the tutorials or information on this site is to be reprinted, resold, or redistributed for profit. It may be printed out for personal use or distributed electronically provided that entire file, including the copyright notice, remains intact.